Five years from now, when you're driving your plug-in electric vehicle (PEV) to a family holiday gathering, you won't need to worry about whether you'll be able to recharge your car battery at Grandmother's house. The connectors (that is, the plugs and sockets) used by all types of electric vehicles will work together, thanks to three standards identified and approved by the Smart Grid Interoperability Panel (SGIP). Is an electric plug really that big a deal? Well, if you've ever traveled internationally and tried to plug in your electric hair dryer, electric razor, or cell phone charger, you'll know that today's electric connectors come in many shapes and sizes. 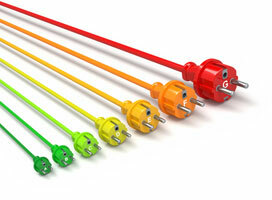 Over a dozen different styles of electric plug are in use today around the world. 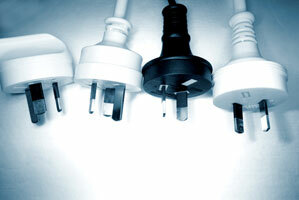 These styles were developed independently as national and regional electric systems grew throughout the 20th century. Not wanting to repeat that chaotic situation in the 21st century with the next generation of the electric grid, known as the Smart Grid, technical experts from many organizations are working together to develop standards that ensure "interoperability." Interoperability is the ability of diverse components in a complex system to work together seamlessly. In the Smart Grid now being developed in the United States and around the world, those diverse components will include everything from solar panels, coal-fired power plants, and wind farms to your local power substation, your washer and dryer...and your electric car. Unlike today's power grid, which just delivers electricity in a one-way flow from generator to outlet, tomorrow's Smart Grid permits the two-way flow of both electricity and information. As described by those helping to build it, it's "electricity with a brain," "the energy internet," and "the world's most complex machine." Therefore, when your electric car arrives at Grandmother's house, you'll be able to do much more than just plug it in for a charge. With the two-way flow of information over the Smart Grid, for example, key data can be shared between your PEV and any other part of the power grid. That means that even if Grandmother lives in a region of the country served by a different electric utility, you'll know that the costs for your car's battery charge can be billed to your home account. You'll also be able to use up-to-date information to be a "smart" charger, choosing the least-expensive time of day to do the charging. The two-way flow of electricity enabled by the Smart Grid will also open up possibilities that surprise those of us still thinking in terms of the 20th century power grid. 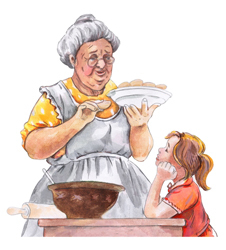 For example, if Grandmother's house loses electric power because of a nearby storm, you will be able to provide power to her house from your car battery. And the extra electricity generated by those solar panels on the roof of her house can be sent to the grid and then to your car's battery. For over a decade, consumers have been able to buy hybrid vehicles, such as the Toyota Prius, that are powered by both electricity and gasoline. The batteries in these hybrid cars are recharged by electricity generated from the car's gasoline-powered internal combustion engine. In most cases, this type of hybrid car does not plug in to the power grid. Beginning in late 2010, however, U.S. consumers have been able to buy plug-in electric vehicles from major car manufacturers. The Chevrolet Volt is a plug-in hybrid electric vehicle (PHEV), and the Nissan LEAF is a plug-in electric-only vehicle (EV). Several other car manufacturers will unveil their plug-in electric cars in 2012. Over the next decade, the number of PEVs in the United States is likely to reach several million. 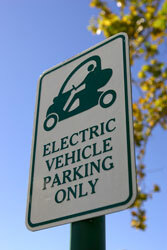 In his 2011 State of the Union address, President Obama set a goal of one million electric vehicles on the road by 2015. The federal government and some state governments, such as California, are encouraging the transition to electric vehicles, because PEVs promise significant benefits in terms of energy efficiency, reduced carbon emissions, and energy independence. The pace at which electric vehicles grow in market share will depend on a wide variety of factors, from consumer acceptance and technology innovation to gasoline prices and government policies. However, it is clear that the transition has begun, that it will affect each of us, and that a very important first step in this transition is the development and acceptance of interoperable standards. John McDonald, chair of the SGIP Governing Board, says, "Standards are absolutely essential to uniform and interoperable communication systems throughout the grid. And these electric vehicle standards will accommodate the rapid integration of PEVs onto the grid." When the SGIP Governing Board and Plenary voted to recommend three key PEV standards for inclusion on the SGIP Catalog of Standards, it sent a strong "full-speed-ahead" signal to SGIP's many stakeholders—from manufacturers and regulators to utilities and consumers. To determine whether a standard was ready, the Governing Board and Plenary took a number of factors into account, including the maturity of the standard, the resolution of previously identified issues, and a satisfactory review of cybersecurity requirements. The physical details of the charging method. The information exchanged during the charging process. The first standard concerns the physical connector used to plug in an electric vehicle. This standard (also called a "Recommended Practice") specifies such details as the dimensions, functions, and configurations of the vehicle inlet and mating conductor. Early adopters of PEVs will be pleased to know that this standard is already being used for the Nissan LEAF and the Chevrolet Volt. "By standardizing the connector, you're reducing costs and allowing everyone to use the same connector," said Gery Kissel, GM, chair of the SAE task force that developed this standard. "All of the charging equipment you would pull up to in public would have identical connectors, so any vehicle could use one. It will be a consistent, reliable interface." The technical name of this first standard is "SAE J1772TM Electric Vehicle and Plug in Hybrid Electric Vehicle Conductive Charge Coupler." Any organization or individual wanting to use this standard can purchase the document at the SAE website. "Charging your vehicle at the right time will be important for people, because on the Smart Grid, electricity will cost different amounts depending on the time of day," says Eric Simmon of NIST's Software and Systems Division. "It was important to ensure we had standards to communicate the best times to start and stop charging, as well as the pricing information. People will care because the more they participate in working with the utility to manage their account, the more they can save." Because PEVs will represent a major new use of electric power, economic considerations will be important to both consumers and utilities. 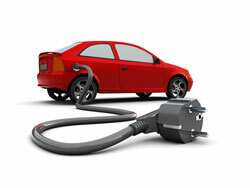 An electric vehicle, for example, will use about as much energy as a typical house. 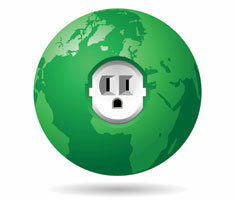 Therefore, utilities must prepare for this significant new demand. "The biggest challenge for utilities is managing the grid during peak times, a time when energy is the most expensive and demand is greatest," said Rich Scholer of Ford Motor Company, chair of the SAE Plug-In Vehicle Communication Task Force. "As we add more plug-in electric vehicles to the grid, we're increasing our need for on-peak power and infrastructure." With the information made available by the adoption of this standard, utilities will be able to develop programs that enable consumers to charge their vehicles at the lowest cost during off-peak hours, such as during night-time hours. This same information will help the utilities reduce grid impacts by minimizing electric vehicle charging during peak periods. According to Jose Salazar, Manager, Electric Vehicle Standards for Southern California Edison (SCE), "The adoption of these new standards will accelerate development of PEVs that can seamlessly integrate with the electric utility grid." The technical names for this standard are "SAE J2836/1 Use Cases for Communication between Plug-in Vehicles and the Utility Grid" and "SAE 2847-1 Communication between Plug-in Vehicles and the Utility Grid" Any organization or individual wanting to use a standard can purchase the document at the SAE website. Bringing together, in an open and consensus-based process, all the individuals and organizations involved in the Smart Grid is a complicated challenge. Within the SGIP, the many tasks involved in standards development and coordination have been assigned to various committees, working groups, and task forces. The working group that has been dealing with the Smart Grid standards for electric vehicles is known as "Priority Action Plan 11" (PAP 11: Common Object Models for Electric Transportation). Since its first meeting in August 2009, the members of PAP 11 met regularly in both face-to-face meetings and conference calls. As in the case of other PAPs, the members of PAP 11 did not directly write the standards. Rather, they coordinated their efforts with those of standards-setting organizations (SSOs). In the case of electric vehicles, the SSO playing the lead role is SAE. The SAE International is a global association of more than 128,000 engineers and related technical experts in the aerospace, automotive, and commercial-vehicle industries. To glimpse the full extent of their work and to dive into the technical details, interested readers can visit the collaborative wiki web site for PAP 11. Now that the assignment has been completed, PAP 11 has been "closed."